This lovely 4.8 cm / 1.9" in diameter Orgonite® pendant is made out of lots of brass, aluminium, bronze and copper shavings and 24K Gold. According to Wilhem Reich's research lots of metal shavings are neccessary to remove stagnant energy. 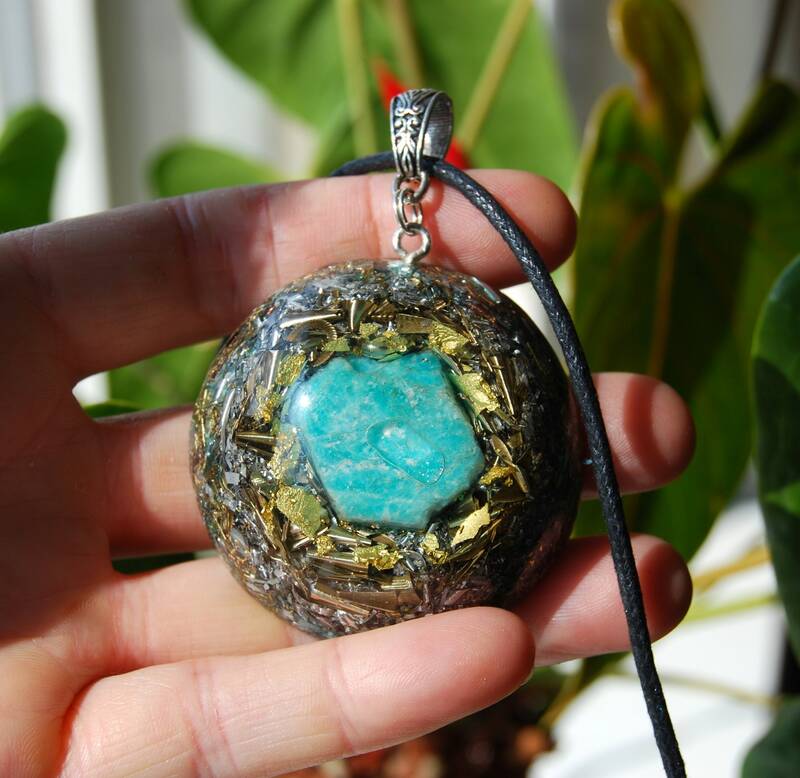 The main stone is a raw Amazonite in the front. Furthermore it consists Rose quartz (self love), Pyrite (to enhance and deflect extremely low frequencies), black Tourmaline (to protect and ground excess energy), Rhodizite (to amplify) and clear quartz (for piezo-electric effect) all within a durable resin setting. 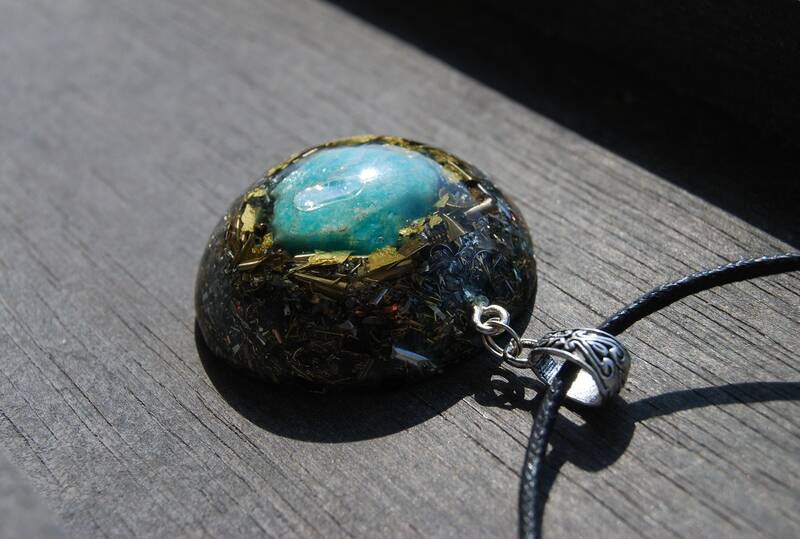 Amazonite is a fantastic energy filter. 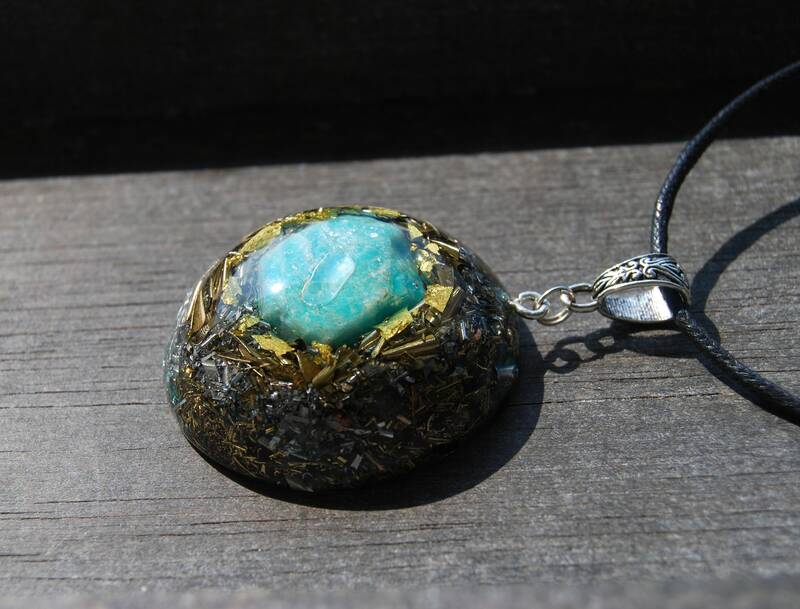 This stone can be very beneficial to you, especially if you use the computer, tablet, cellphone, or microwave oven a lot. 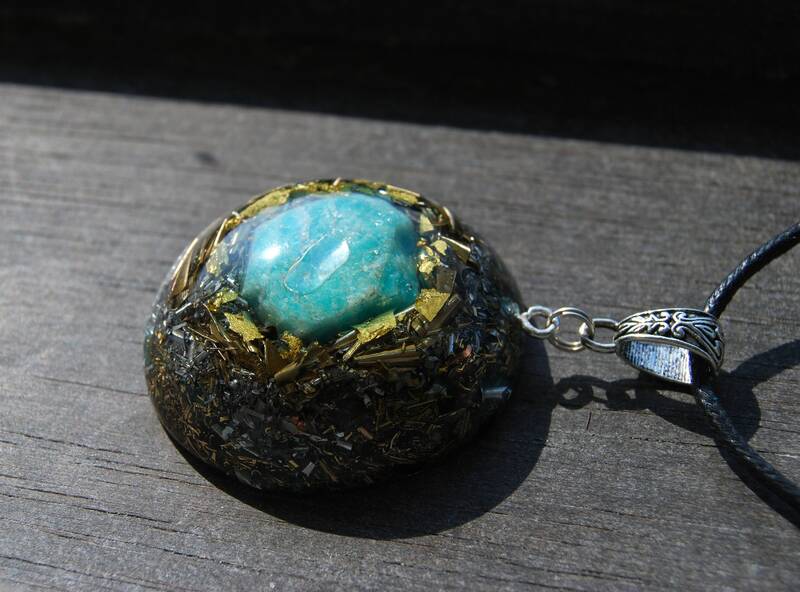 These things are filled with electromagnetic smog, and amazonite can help cleanse your aura of this smog. It will also work on calming all your chakras. Not only that, it will help you balance your masculine and feminine energies so that you will be able to utilize them in the most positive way. This stone will make sure that your yin and yang energies are in harmony as well. This stone will help clear your muddled thoughts and make you better understand yourself, what’s happening around you, and what your impact is to the people in your life and to the rest of the world. It’s a great stone for anyone who is passionate about artistic pursuits. It can unleash the creative and imaginative side of you and help you in your projects and your artistic visions. 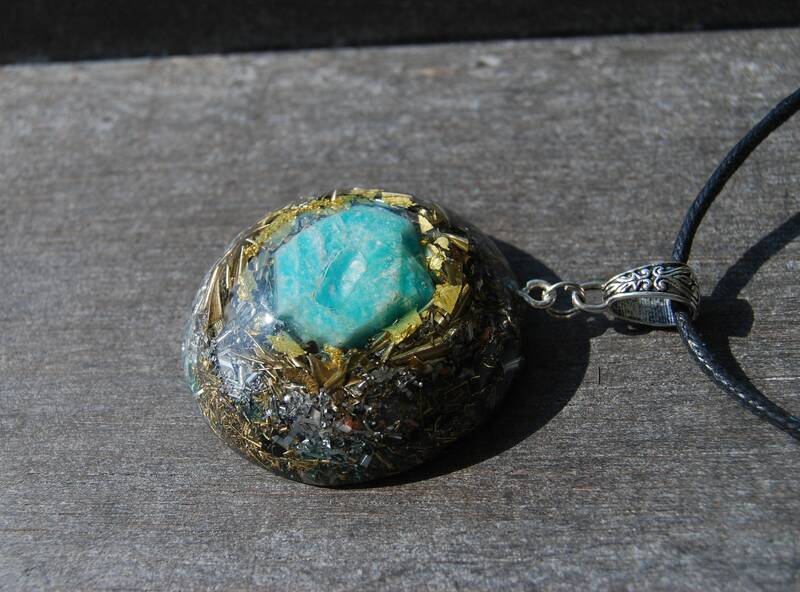 Amazonite is also a great stone to have if you want something to manifest in your life. This stone will encourage you to be bold and brave, to make your dreams come true, and to keep trying until they do! It will bring you lots of joy and happiness. It will also show you how you can keep this joy and happiness in your life for good. It’s the stone of truth and courage and has similar energies as Labradorite. Once you have this stone in your life, you can expect to be empowered by the truth. You can live on your own terms and just shrug off any fears or worries that you have. 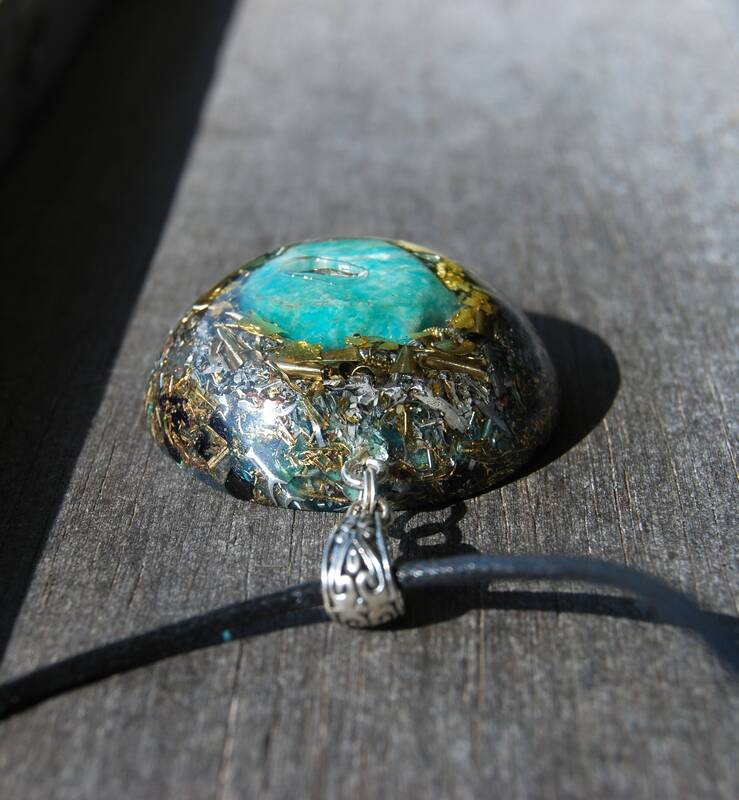 This stone will make sure that your senses are in tune with your surroundings, and that you feel most connected to yourself. 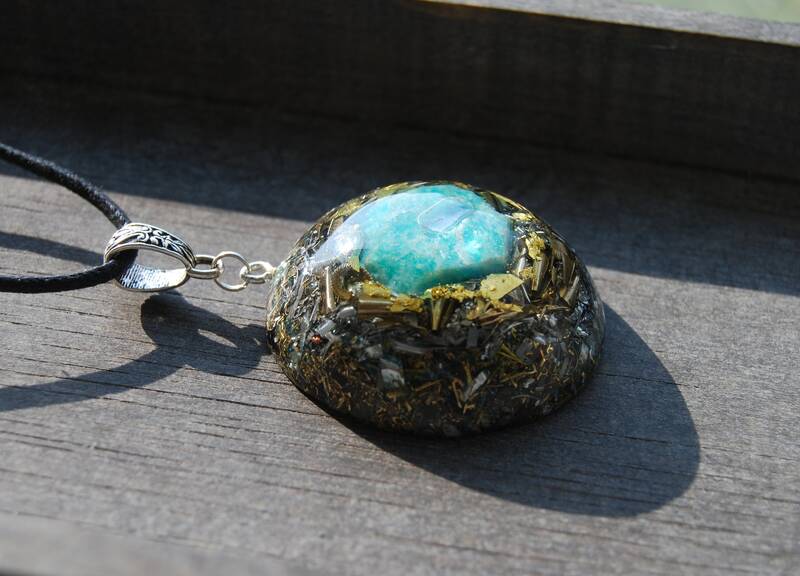 If you want a strong and empowering stone to guide you in life, the amazonite is it! It comes on an 47 cm / 18 inches gold plated chain with lobster clasp closing.